Eating breakfast can help you to get the recommended daily values of various nutrients essential to good health. Skipping breakfast can result in some truly negative consequences for your health. Why is breakfast so important? If it is, why do so many people, adults and children alike, leave the house in the morning without having breakfast at all? Maybe you feel rushed to put together a meal, think that skipping breakfast with help you to lose weight, or believe it won’t matter if you eat more later to make up for the missed meal. The truth is, skipping breakfast can result in some truly negative consequences for your health. So why is breakfast important, and how can you be sure to get in a healthy, wholesome morning meal each day? Eating a good breakfast can help you to get the recommended daily values of various nutrients essential to good health. Studies show that kids who eat breakfast have 20 percent to 60 percent higher levels of iron, B vitamins, and vitamin D compared to skipping breakfast, for example. Raise the risk for heart disease. Skipping breakfast is associated with an increased risk for obesity, metabolic syndrome, elevated triglycerides, high LDL-cholesterol, and low HDL-cholesterol (all risk factors for cardiovascular disease) in children. A large study published in the journal Circulation followed over 20,000 men for 16 years, and found that those men who skipped breakfast were 27% more likely to develop coronary heart disease. Lead to weight gain. In a large study on thousands of children and adolescents, breakfast skippers had higher BMIs and waist circumferences than those who ate breakfast regularly. There were also higher rates of obesity among breakfast skippers. In one study, people who moved a large percentage of their energy intake to their morning meal had lower weights (as well as improved insulin function) compared to people who ate most of their energy later in the day. Impair cognitive abilities and academic performance in children. Children who regularly eat breakfast have higher IQs than those who only eat breakfast on occasion. Regular breakfast consumption is associated with better behavior in school and better academic performance, including better grades and achievement test scores. School breakfast programs, where kids are given free breakfast before school, are associated with positive academic achievement as well. Increase the risk for diabetes. There is a wide body of evidence showing that consuming breakfast regularly can protect against type 2 diabetes. [7,8] A large meta-analysis of studies found that people who skip breakfast have a 15% to 21% higher chance of developing type 2 diabetes compared to those people who eat breakfast regularly. Hurt your bone health. Breakfast consumption can also help protect your bones. In a study following male Japanese medical students, skipping breakfast was identified as a major lifestyle factor that contributed to bone mineral density loss. Even if you are short on time in the morning, fitting healthy breakfast foods in is very important for your health. If necessary, wake up a bit earlier to make the time you need to prepare your food (or better yet, set yourself up the night before to make breakfast as easy as possible). My favorite quick and simple breakfasts include oatmeal; yogurt with mixed berries out of the freezer; gluten-free pancakes with oats, quinoa, and other hearty whole grains; or a vegan scramble with potatoes, kale, peppers, and onions. What are your favorite healthy breakfast recipes? 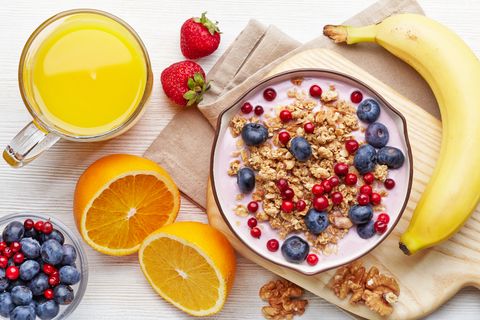 Share your tips for get eating a healthy breakfast each and every day in the comments section below. Front Hum Neurosci. 2013 Aug 8;7:425. J Pediatr (Rio J). 2013 Nov-Dec;89(6):575-82. J Am Diet Assoc. 2010 Jun;110(6):869-78. J Am Coll Nutr. 2014;33(3):198-205. Early Hum Dev. 2013 Apr;89(4):257-62. J Bone Miner Metab. 2014 Jul;32(4):420-7. 2 diabetes, Lose Weight, Triglycerides, b vitamins, bone, bone health, bone mineral density, breakfast, cardiovascular, cardiovascular disease, children, cholesterol, coronary, coronary heart disease, diabetes, diet, food, gluten, gluten free, gluten free pancakes, good health, hdl, hdl cholesterol, health, health news, healthy breakfast, healthy breakfast ideas, healthy breakfast recipes, healthy snacks, heart disease, high ldl, high ldl cholesterol, insulin, iron, kale, ldl, ldl cholesterol, low hdl, low hdl cholesterol, metabolic syndrome, natural energy boosters, nutrients, obesity, potatoes, protein, quinoa, reasons why breakfast is important, risk factors for cardiovascular disease, skipping breakfast, studies show, triglycerides high, type 2 diabetes, university health news, vitamin, vitamin d, vitamins, weight gain, whole grains, why is breakfast important, why is breakfast so important, yogurt, your bones. Of course there is no such thing as a one-size-fits-all diet, and I believe that applies to the time of eating as well. I have never eaten breakfast on a regular basis since I was a teenager, and I’m absolutely certain that that’s the right thing for me. I don’t get hypoglycemic or have any tendency to pig out on unhealthy, sugary snacks later in the day. I am now 65 years old, 5’8″ tall and weigh 130 pounds with a 30″ waist, not exactly morbidly obese. My resting blood pressure is about 110/65, resting pulse is about 65, and I do not have any of the so-called “risk factors” for heart disease. My father, who always ate breakfast, developed type II diabetes in his 30’s, but I have never had it. He was also about 50 pounds over weight. Statistics are nothing but statistics, and really say nothing about the needs of any particular individual. This body that I live in obviously does not need and certainly does not want breakfast, and I would probably be less healthy — maybe even becoming overweight — if I started forcing myself to eat breakfast anyway. The best dietary advice I could give anyone is, get in touch with your body, listen to it carefully, and treat it with loving kindness. Never mind what any statistics may say, because they may well have nothing at all to do with what your own health needs are. Thank you for your response, Greg. I am glad you brought up such an important point. I certainly agree that each one of us is unique, and so are the needs of our bodies. 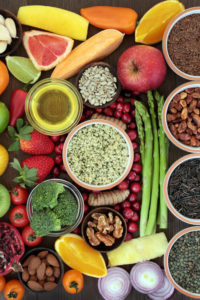 I appreciate your dietary advice of “get in touch with your body.” Learning what your body needs and how it responds to what you feed it is an essential tool in staying in top health. As you said, there is no one-size-fits-all diet. Some people, such as yourself, who seem to be able to maintain great health without breakfast, don’t necessarily need to change their habits. But for others, such as those who are still dealing with chronic health problems, or those who don’t feel satisfied with their current diet, eating breakfast regularly might be worth their while. The data shared in this article simply suggest that for a lot of people (even most people), eating breakfast is a healthy habit that has a range of benefits. But certainly this doesn’t mean everyone has to eat breakfast to be healthy. I rarely ate breakfast for many years. In fact, I believed that exercising on an empty stomach was preferable and I quite enjoyed it. But my body has changed over time and I now have to eat something small before I leave the house. My favorite new word is the one that describes me if I don’t eat breakfast now: hangry. I completely agree with Greg that the most important thing is to listen to your body.